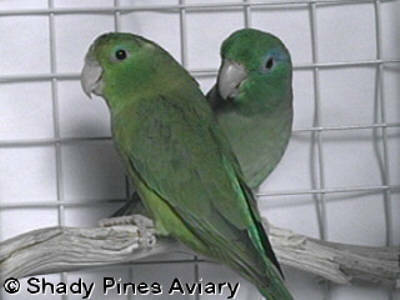 The most popular Pacific parrotlet a/k/a Celestial, is also the most commonly available. 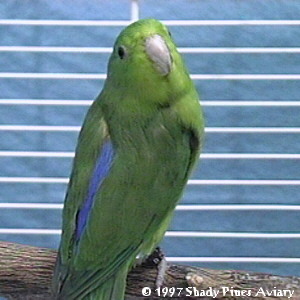 The male is a dull green color with a bright apple green mask and a light blue streak behind the eye which blends into silvery blue at the nape of the neck. The rump, lower back, and wing coverts are cobalt blue. Females are a duller version of the male and lack the blue on the wings. Some have a faint blue streak behind eye. Females of the Lucida subspecies are more brightly colored and can have shades of blue on the rump. Beak and feet are a pinkish horn color. Several beautiful color mutations are being bred in this species. Click here for more detailed species characteristics. 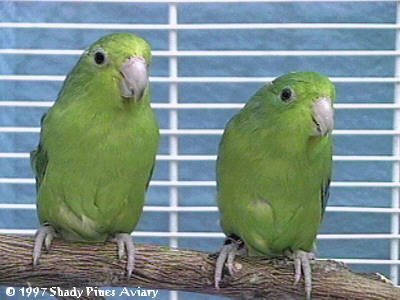 Second most commonly available, the Green-Rumped parrotlet is among the smallest of the parrotlets. The males are mainly bright emerald green. 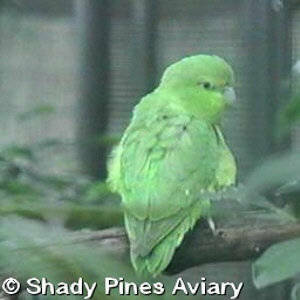 As the name implies, the rump is green although certain subspecies may have a pale blue suffusion on the rump. The wings are shades of cobalt blue and ultramarine. Females are entirely green with yellow to yellow-green on forehead. Beak and feet are a pinkish horn color. Click here for more detailed species characteristics. 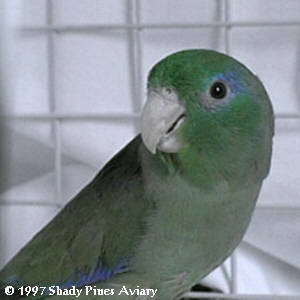 Somewhat uncommon, the Blue-Winged parrotlet is a sleek, slender bird. Darker green than the Pacific or Green-rump, it has lighter green around the eyes, ear coverts, and cheek. The male Blue-Winged have shades of violet-blue on the wings and bright violet-blue appearing on the rump after their juvenile molt. 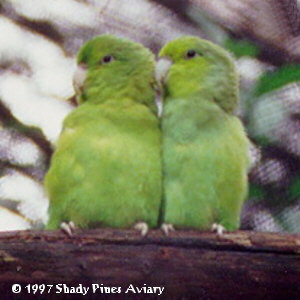 Females are entirely green with forehead and facial area shades of yellow-green. Legs and feet are bluish-gray, and the beak is a grayish horn color. Click here for more detailed species characteristics. 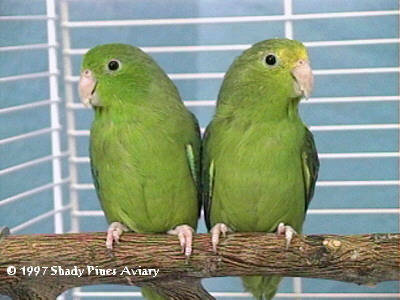 Among the largest of the parrotlets, the stocky Mexican parrotlet is somewhat hard to find due to poor breeding in captivity. Their calm, laid back behavior is suited to colony breeding in a large aviary. Males are dark green with shades of turquoise blue on their wings. The rump changes to a brilliant turquoise blue after their juvenile molt. Female Mexicans are entirely green with all blue markings replaced with yellow-green. Legs and feet are bluish-gray. Beak is a horn color, turning dark in the female when in breeding condition. Click here for more detailed species characteristics. 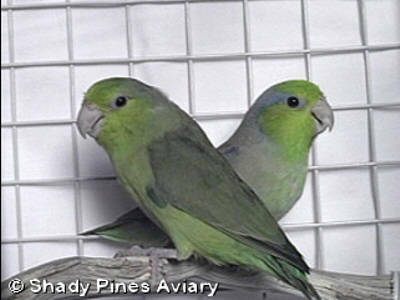 The tiny Spectacled parrotlet is the newest addition to US aviculture. Although a limited number of bloodlines were imported from Europe, they have proven to be quite prolific. The male Spectacle is a deep green bird with bright violet-blue on wings and rump and surrounding the eye in a distinctive ring. Females are lighter in color, lacking any blue markings. Eye is surrounded with bright emerald green. Legs and feet are pink, beak is pinkish-white. Click here for more detailed species characteristics. 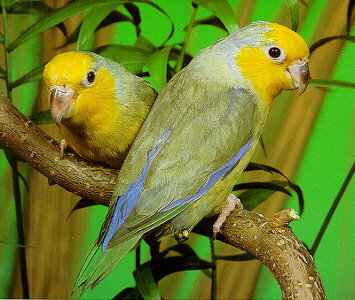 The largest of all Forpus, the Yellow-Faced parrotlet is also among the rarest. In the U.S., there is only a small number of birds descending from the only legal importation of this species in 1980. This bird has bright lemon yellow on it's crown, face and throat merging into yellowish green on the under parts. The upper parts are greyish green with the male having deep cobalt blue on the lower back, rump and wing coverts. The female also has blue on the rump and wing coverts although it is a much lighter shade of blue. Click here for more detailed species characteristics.